How To add a "Click to Tweet" link to Quotes within your posts? Tweet buttons on a website allows users to tweet the link to a post or page, along with its entire meta title. But the title isn't always what you want users to tweet, since it is designed with SEO in mind, and could look unseemly and out of place on Twitter. Instead, you might want users to tweet about an interesting fact, a quote or an opinion. Wouldn't it be cool if users could simply tweet that specific quote or fact by just clicking on a link or button? Check out how to create "Click to Tweet" links for quotes within your posts or pages. 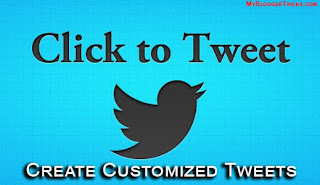 ClickToTweet is a small online tool that will let you easily create tweet-able text. Before you use it, you first need to have your content ready. ...and you want users to tweet this interesting figure. First, get your text ready (it would be very similar to the quote I've written above, with only a slight difference. For example, "Did you know, since its Launch, the total number of Facebook likes has crossed 1.13 Trillion!" Next, generate a shortlink to your article, or a section of your article. You can use any of the shortening services such as Bitly. Paste this into the ClickToTweet text area, and click on the Generate Link button. You will get a link which you can paste wherever you want in your post. Mine looks like this; http://clicktotweet.com/JSsTf. Let's go ahead and test it out. Check out the final implementation of this nice little feature below. If you click on the tweet link, you'll see that you'll be prompted to tweet it just the way we wanted above. Just try it out! Thanks @Qasim Zaib, Really useful thing. Thanks to introduce this idea to your readers like me first. This is interesting. I blog about civil engineering and construction and my article contains many technical terms which readers sometimes want to collect and share with their friends but not full article. Now I'll implement this in my blog post for their convenience. Really good post. Thanks Quasim Zaib.